If you grew up during the 1970s, you probably remember the egg-shaped Weeble toys and their marketing slogan, “Weebles wobble but they can’t fall down.” I don’t know if Weebles are based on their much older counterpart, the Japanese Daruma or “Roly-Poly” dolls, but they could well have been. Daruma dolls are shaped like giant Weebles and, because they don’t tip over, are symbolic of perseverance and of the martial arts saying, “Seven times fall down, eight times get up.” Daruma dolls are quite old, having originally been based on a Chinese paper machee doll called the Chinese Drinking Companion, or “old man who never falls down.” And Daruma dolls have come to be used as reminders for goals that people set — you can buy a Daruma doll, paint in one of its blank eyes, and then hold off on painting the other until your goal has been reached, so that the Daruma acts as a constant reminder to keep working toward your goal. Why this journey into toy history? 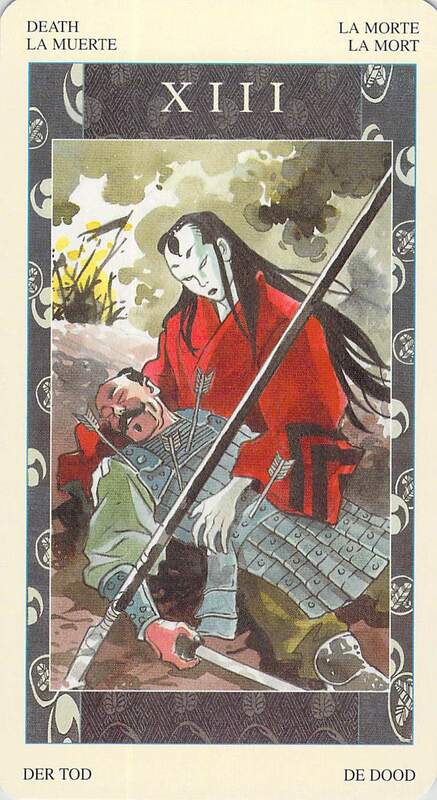 The first card I drew today, the Queen of Pentacles from the Samurai Tarot, is connected with Daruma, according to the Samurai Tarot book. The male Daruma is based on Bodhidharma, the monk who brought Zen Buddhist practice to China and who is said to have meditated for nine years in a cave facing a wall. But this card depicts a woman. Researching Daruma, I found that there is also a female Daruma, called Princess Daruma or Lady Daruma, which is said to have been based on a very diligent samurai wife named Aya, who persevered in living a pure, sincere life despite adversities, including mistreatment by her mother-in-law. If you’re interested, you can find out more at the Daruma Doll Museum, which is where I found the Daruma picture shown here. I was puzzled as to what Lady Daruma was doing in my reading for today, however, especially combined with (again!) the reversed Ace of Chalices. 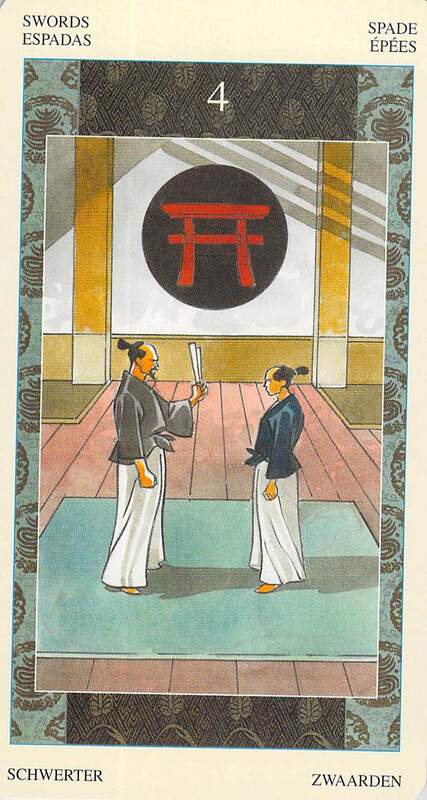 I drew two more cards, reversed Death and reversed Four of Swords, forming a four-card square with all the cards drawn. 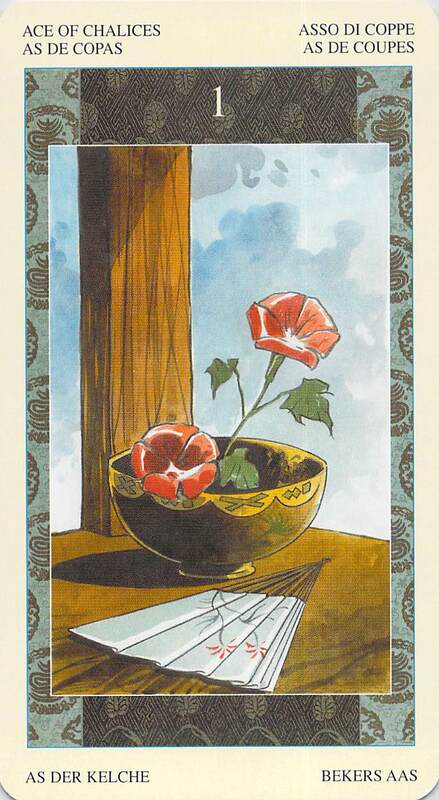 So what we have are: Lady Daruma, plus three cards indicating mental blocks, depression, weariness and fatigue, and generally not being ready for transformation. I think that depression and adversity are hitting us hard this week. 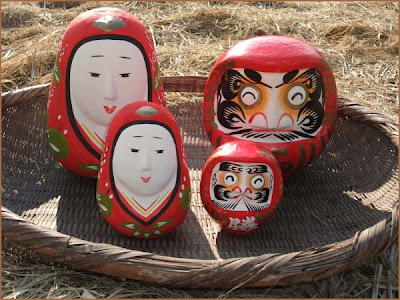 But like Lady Daruma and Daruma, we are not so easy to defeat — once knocked over, we spring back up again. Yes, there’s a sort of lethargy and depression lying heavily in the air lately (wait, or is that humidity? do you notice how both the Queen of Pentacles and the reversed Ace of Chalices show fans? ), but despite our own feelings of being drained and tired, we somehow keep popping back up, without even knowing for sure how or why. Despite our attempts at self-sabotage, despite our depression, despite our fatigue, despite our resistance to the lessons we are supposed to be learning, despite our strong emphasis on failure, karma or the universe or good luck is with us and we simply can’t be knocked out of the game right now. 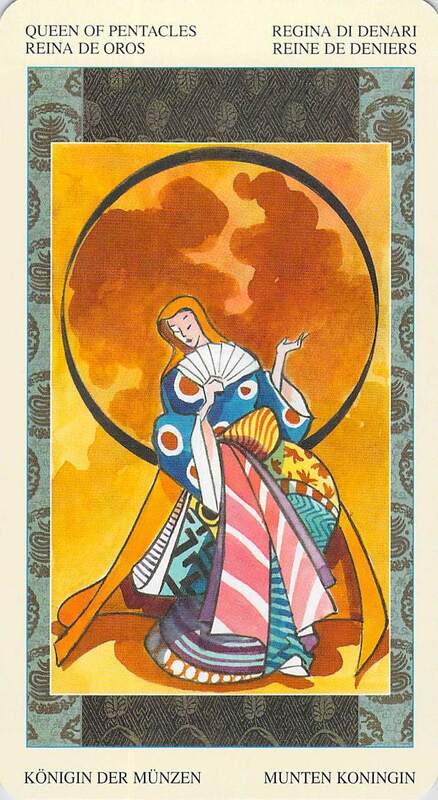 Next Card for the Day: Luna: No Full Moon Today — It Just Feels Like It! You should use the Samurai Deck more often.